Biologists tracking jaguars in the Guatemalan jungle might smell nice but it's all in the name of science, with researchers using the Calvin Klein cologne Obsession for Men to attract big cats. Biologists Rony Garcia and Jose Moreira from the Wildlife Conservation Society's (WCS) jaguar conservation program say they use hidden cameras as a primary source for observing and tracking the animals in Guatemala's Maya Biosphere Reserve. But they also rely on Obsession for Men, a cologne known for its complex scent, to help lure them for research purposes. 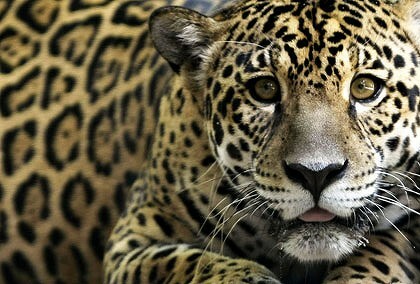 Ultimately, their aim is to help preserve jaguars in the Central American country. "The method we are using to study the jaguars here in Guatemala is an invasive method which is based on photographing the individuals by using camera traps," Moreira told Reuters Television. "It has been very useful using Obsession (for Men) to get the jaguars in front of these camera traps ... and that allows us to estimate with greater confidence the genders and the numbers that live in each studied site." The discovery that Obsession for Men acted as a magnet for jaguars was the result of an experiment by the WCS's Bronx Zoo in New York. The WCS was looking for ways to get cheetahs in front of camera traps, and, after several years of testing with different fragrances, found spraying the musky Obsession For Men near the heat-and-motion-sensitive cameras drew the cats for longer than other scents. They also tried out about 23 other fragrances but Obsession for Men kept the cats' attention for longest. Nina Ricci's L'Air du Temps came second. The practice made it's way down to Guatemala, where Garcia and Moreira said they have been recording similar success in the wild since 2007, allowing them to track jaguars and even record their mating rituals. Garcia said the results will be invaluable to conservation efforts. "These camera traps help us to identify how many jaguars are living in this area ... (and) helps us to have control over the population and lets us say to the government, to the public, that Laguna del Tigre still deserves conservation," he said. The WCS said it tentatively plans to expand the use of the cologne in programs in Venezuela, Nicaragua, Bolivia, Peru and Ecuador in coming years.